Mara Abbott has won titles at San Dimas and Tour of the Gila this year, as well as a key stage at the Redlands Classic. BOULDER, Colo. -- Mara Abbott's voice is declarative as she talks about intimate things, rising above the hubbub in a crowded café as she makes a point, fast-paced and strong enough to give people at other tables a free seminar on self-esteem. 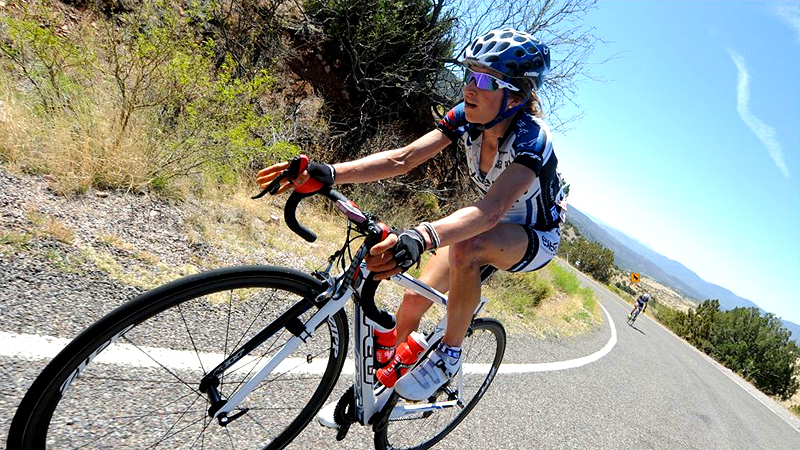 Abbott won a national collegiate road title four months after she first raced a bike. She won U.S. nationals the next year. In 2010, she became the first American champion of the toughest women's stage race in the world, the Giro Donne. Even as the gifted climber made that ascent, she let external stimuli flood her head with doubt. Great road cyclists necessarily have great peripheral vision. There can also be such a thing as too much of it. "If I could turn off my brain, it would be so easy," Abbott said with a broad smile as a coda. "[Talent] begets responsibility -- responsibility for being that good," she said. "If someone's inspired by you, you're responsible for holding that space, responsible for people looking at you. If you hold back, you don't have to take responsibility for what you are." Abbott's ambivalence fueled a destructive eating disorder and she effectively knocked herself off the bike. After a year away, the 27-year-old has found her balance again. She will line up at the Tour of California Women's Invitational time trial Friday in an elite field of 15 with no second thoughts about whether she belongs there. Off the bike, Mara Abbott teaches yoga and also serves as an assistant coach for her old swim team. "She's not sitting on the bike -- she's part of the bike now," said Nicola Cranmer, founder and general manager of the Exergy TWENTY16 team, who opened the door for Abbott to re-enter the sport when she knocked last year. Athletes often address fear of failure, but it's rare to hear one flip the page and speak as candidly as Abbott about the anxiety success can cause. In some ways, it should be no surprise that a personality as bright and eclectic as hers -- deeply rooted in a yoga practice and bent on an eventual career in environmental policy -- would chafe at the more single-minded, selfish aspects of a professional cyclist's lifestyle. Abbott spent her youth and early college years as a distance swimmer, specializing in the mile but never achieving what she'd envisioned; she still speaks self-deprecatingly about never making her sectional meet cut in high school. She began riding as a lark at the urging of friends at Whitman College, where she earned an economics degree. "I fell into cycling by accident," Abbott said. "Cycling picked me." She loved training, especially when it provided another way to commune with her beloved mountains. Her longtime coach Dean Golich, who advises her largely by phone and text from his base in Colorado Springs, said he never worried about her discipline and desire to improve; but flying around the country and the world to race did not suit Abbott as well. Through a succession of pro teams -- Webcor, HTC, Peanut Butter & Co., Diadora -- she struggled to integrate her other interests with the vocation she believed had fallen into her lap. A certified yoga instructor, Abbott did yoga podcasts at big races and taught at home and on the road, but found it increasingly hard to keep breathing freely. She frets about non-recyclable food packaging and once went an entire year without refilling the gas tank in her car, so she couldn't help but see the carbon footprint of a big race -- the fleets of vehicles, the waste generated by teams and spectators -- and feel she was part of a problem rather than its solution. "How do I fix that?" she asked herself constantly. "I want to save the world, save the environment, get a real job." That internal conflict took a hairpin turn into something harmful. Abbott slid toward anorexia in 2011 and everyone around her could see her body change and her ruddy complexion fade. Cranmer said other riders called her during the Giro Donne that year saying they feared for Abbott. It's not hard for Abbott to analyze that period in hindsight. An eating disorder is frequently a perverse means of exerting control, and becoming dangerously thin equated to a silent yoga pose that expressed how unhappy and stretched she felt. Despite her accomplishments, she felt as if she had drifted into the sport without ever making a full commitment, and was uneasy at the idea of being the team leader on whom so many relied. [Talent] begets responsibility -- responsibility for being that good. If someone's inspired by you, you're responsible for holding that space, responsible for people looking at you. If you hold back, you don't have to take responsibility for what you are. "This wasn't about my stomach or my psyche, it was about my voice," she said. "Everything was laid out perfectly for me. I didn't understand why I wanted out, so I tried to find a way to get myself out. I was trying to restrict myself out of a lifestyle I wasn't comfortable with. I couldn't say it, so I made the shape of it, embodied it." After finishing 10th in the Giro Donne that year, Abbott dismounted. She was still on contract but said she had no further contact with her Italian team's management. She and Golich never stopped talking, however, and she calls him a "Zenmaster" who let her know he had her best interests in mind without making her feel pressured. "He got the background noise out of my head," she said. Golich, who coaches athletes in motorcycle and auto racing as well as cycling, said he suggested one specialist after another to help Abbott -- "anyone I thought could communicate." "I was somewhat aggressive," he said in a telephone interview. "She knew where I stood. But I also tried to create less stress and friction in her life. ... She's won enough -- if she quits tomorrow, I don't care, and she knows that. Whatever she says she wants to do, I'll try and help her." Abbott took up trail running until a foot injury sidelined her. It was the first time in her life that she had been forcibly idled. She craved hard training and began to understand that her demons had nothing to do with cycling itself. She had a rare opportunity to be the best at something and she finally admitted that mattered -- perhaps not more than global warming, but it could provide her a platform to stump for environmental causes. This time, Abbott picked up the phone and called Cranmer. She picked cycling instead of the other way around. "I wanted to make sure she was healthy," said Cranmer, who had always suspected Abbott would come back to the sport. She talked to Abbott's parents and her coach, and "had a straight-up conversation with her about how she had been dealing with [her eating disorder]. It's a lifetime process. It's not something you are or you aren't." Abbott stopped over-thinking every pedal stroke and began just riding again, beginning with her first event back as a guest member of Cranmer's team in Aspen last summer. Since then, she's been as grounded as she once was wobbly. She has gained back most of the weight she lost, and has won overall titles at San Dimas and Tour of the Gila this year, as well as a key stage at the Redlands Classic. "It's a lot lower-drama," Golich said. "She understands her limitations and what situations she can't get into." Abbott is still intent on what she calls "diversifying my emotional stability" and is competing in several triathlons this season. She still teaches yoga, is an assistant coach for her old swim team and sits on Boulder's Environmental Advisory Board. One of her longest-held unrealized ambitions is to throw out the first pitch at a Colorado Rockies game. 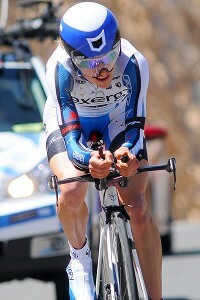 After the California time trial, Abbott will compete at U.S. nationals and is expected to lead the U.S. team in the shortened but still challenging 2013 edition of the Giro. "The biggest shift for me is how confident I am in what I'm doing," she said. "It's made everything easy and simple." She comes across loud and clear.